In certain instances it may be necessary to manually create account code combinations (CCID’s) in Oracle General Ledger. To some extent this is determined by whether your organization has decided to use dynamic insert or not. 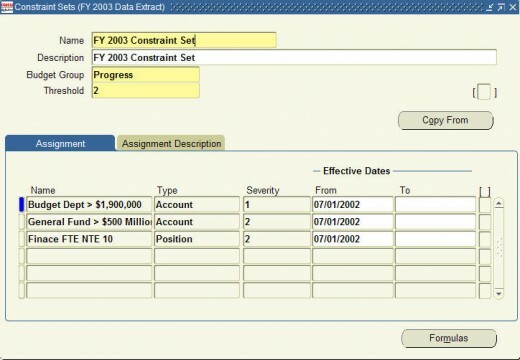 Dynamic insert is an option you can turn on or off when creating your accounting flexfield. If the option is turned on it will allow account code combinations to be automatically generated. 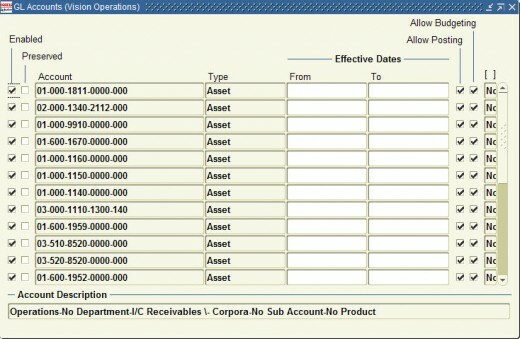 If dynamic insert is turned off then it will certainly be necessary for a General Ledger Super User to go and create an approved set of combinations for use within your organization. Even if dynamic insert is turned on you may find that at the beginning of an implementation that there are not enough active account combinations. This means you will more than likely have to manually add account code combinations as presently Oracle has no automated facility to perform this. To manually add account code combinations one should login under General Ledger Super User and on the navigation menu go to Setup > Account > Combinations. Having navigated to the form displayed in Fig. 1 you can then insert the needed lines. Using this option entails creating an excel spreadsheet journal via ADI with the account code combinations that you would like insert. The account code combinations should contain zero values. After uploading the spreadsheet journal from ADI an unposted journal will be created in General Ledger. The unposted journal can be deleted and the account code combinations that you created will remain behind. The reason for using the spreadsheet journal as opposed to using a journal in General Ledger is that the spreadsheet makes it easier to create the account code combinations you want to load as you can use the copy and paste features. A dataload template can be created and the account code combinations can be loaded directly into General Ledger. Personally I prefer to use the first method mentioned as it is much faster than using Dataload. Another word of advice when creating these combinations. 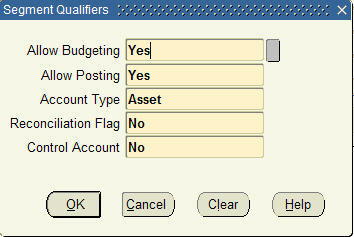 One should ensure that you have correctly filled in the flexfield qualifiers (displayed in Fig. 2) when capturing your segment values as the account code combinations will use this information to determine how a CCID is created. For example, if for any of the accounts in the combination of segment values, you have allow budgeting and allow posting set to “no”, then the account code combinations as displayed in Figure 1 will be created with allow budgeting and allow posting set to “no”. If you create an account code combination with the incorrect value for allow budgeting and allow posting, you can go and manually change the value. However, if you have a large number of lines that have the incorrect values you cannot merely go and upload another blank journal after having corrected the mistake in the flexfield segment qualifiers. You will still have to manually make the amendments as once an account code combination has been created you cannot “overwrite” it. Lastly, if anyone has come up with any other better method or an automated procedure for performing this activity then please add your comments. 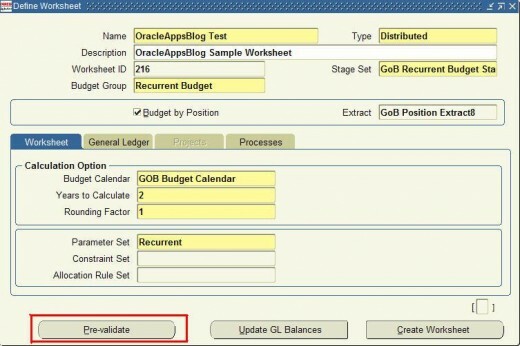 Having implemented Oracle Public Sector Budgeting at two fairly large sites, I’ve gained a good understanding of how Oracle’s Budgeting solution fits together. This post aims to outline the different methods used to post Budget data from Public Sector Budgeting and OPSF(I) in to the General Ledger. I felt the best way to explain how Oracle Budget data is posted into General Ledger would be by using a table as displayed below. The table outlines how budgeting data for a particular area of budgeting is posted in to the General Ledger and also identifies what journal sources and categories would be utilised. One of the main reasons for me writing this post is I felt that these procedures were not clearly outlined in the Oracle Documentation and where it was outlined it was in different manuals. I also get the feeling that the three main mechanisms of getting budget data into the General Ledger, namely worksheets, revisions and dossiers, were perhaps developed by different development teams or at different time periods. This table I have prepared will consolidate the methodology for posting budget data relating to worksheets, revisions and dossiers into one place. My hope is that this will help someone else implementing the same modules who may be going through the same struggle as I initially went through.